A Bud-Pak bulk bag filling system has been installed for filling bulk bags with heavy mineral concentrates at a rate of 10 x 2000kg bulk bags per hour. 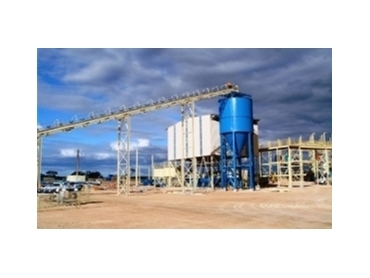 The bulk bag filling station at SA’s Mindarie Zircon Mine is designed as a stand alone unit with bulk bag placement for bag filling performed manually by the operator. The bulk bag strap support hooks are mounted on air cylinders to lower the filled bulk bags directly onto a pallet for removal by fork lift. The bulk bag filling station includes the product surge hopper, heavy duty RHS support frame, filling chute complete with a pneumatic inflating dust tight bag holder and bag pre-inflation and dust collection ports, bag pre-inflation system and mild steel product contact surfaces. A Rinstrum R5100 batching indicator is used to accurately control the amount of material filled into the bulk bags. Budpak has hundreds of bagging and palletising installations throughout Australia, New Zealand and Asia Pacific.